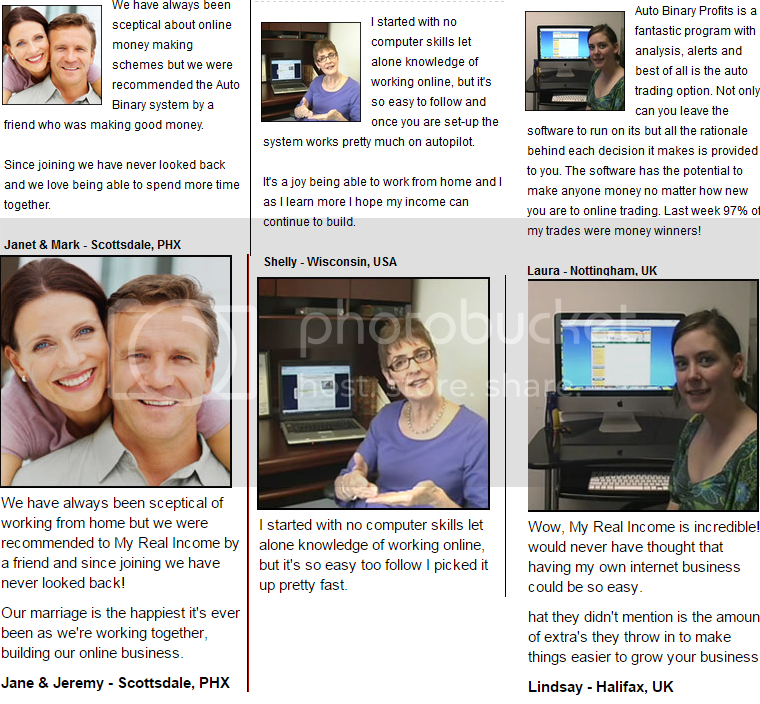 Most Obvious Use of Fake Testimonials? I guess I'm happy to know definitively (because, you know, I was really wondering) that AutoBinaryProfits associated, affiliated, endorsed, or sponsored by Google, Youtube, Facebook, Myspace, Twitter, Digg, Cnet, Amazon, Clickbank, Moreniche, Yahoo, or Bing, nor have they been reviewed tested or certified by Google, Youtube, Facebook, Myspace, Twitter, Digg, Cnet, Amazon, Clickbank, Moreniche, Yahoo, or Bing. I would have stayed up all night wondering about that one. I guess Janet and Jeremy must be running from the law or something since they both decided to chane their names. Last edited by JustTooMuchTime; 02-19-2015 at 09:59 PM. Nice to know about the binary profits.com and its a good profit panel and for the online investments and business system.I like it so much and instructions about it are also awesome.I would like to test it soon. AutoBinaryprofits.co looks very interesting. Do you know how the owner of the business is? It is kind of obvious, everyone knows the reviews are fake, so is the stock photo. Last edited by NikSam; 02-18-2015 at 02:45 PM. Wait you mean that is not a legit procedure? Reminds me of one of my favs from the Dot Com Era I believe. Sounded more like a pot site to me.